Collaborating with you to create the book you are imagining. 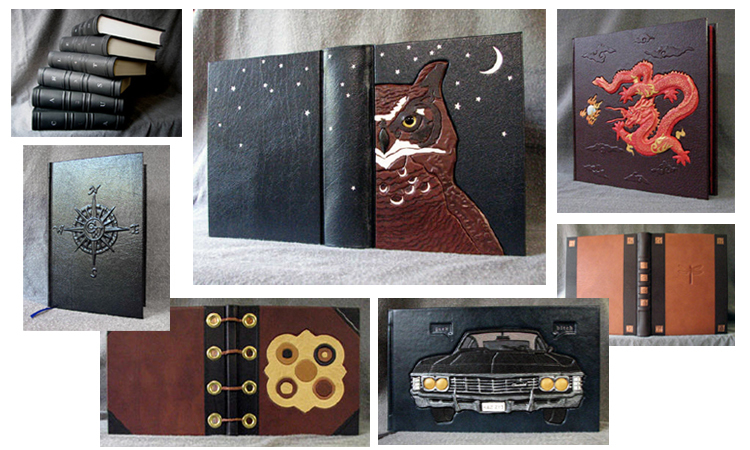 Most of the custom books I make are hand sewn in folded sections called "signatures". This allows a book to lay open all the way to the center of the page. Photo albums are not sewn. They are assembled using a gluing process and archival glue. Photo album pages also lay open to the center of the page. If you ask me to bind single, printed pages, they will be oversewn on an oversewing machine which is a very durable form of sewing. The paper chosen for the book pages is carefully selected. Lined or unlined, it is acid-free. Special attention is paid to the paper weight and paper grain to ensure that the resulting book functions as smoothly as possible. Lined paper is only available in two sizes. All adhesives used are archival PVA (poly vinyl acetate). Some book covers that are covered in cloth-based cover materials utilize animal glue for gluing the cover materials to the boards. 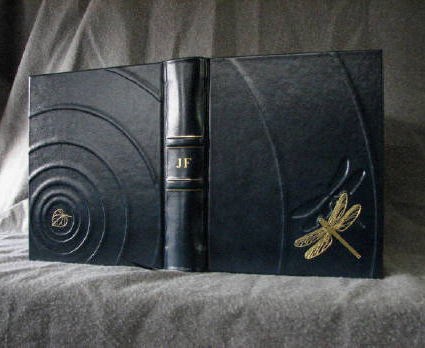 Most covers are made with leather over binder's board. I might recommend pigskin, cow hide, or goat skin depending on the cover design and the desired effect. Some covers you'll see on this site were decorated using hot foil stamping. Foil stamping or lettering cannot be added to the cover or spine of a book once it is finished. I have limited font choice in the old-fashioned moveable metal type that I use for cover lettering. If you want something specific (foil-stamped lettering or decoration), a metal die may be required to achieve the desired result. We can discuss this when you contact me about your order. Constructed to be long-lasting and easy to use, custom-ordered journals and guest books are sewn by hand so that they lay open flat. You, the customer, choose the page size, the number of pages, and the cover design. I'm here to work with you and bring your ideas to life. Any of the gallery links at the top of this page can take you through examples of books that others have asked me to create for them in the past. For these, I use heavy, archival paper for the pages and add spacers to the spine to allow for the thickness of items that will be attached to the pages by you. I include archival, clear, self-stick photo corners or double-sided archival adhesive squares with each order for attaching items to the pages. These make up the majority of my work. The cost and turnaround time depend on how complicated the project is, and, sometimes, on what time of year it is (think "Christmas rush"). Every detail affects the price, therefore, you need to email me so we can work out your order details. On custom orders, once we have all of the details worked out and I've given you a firm price, I will send you a PayPal invoice for half the cost of the order (excluding shipping). I will start working on your order when I receive your payment. When the book is done, I will email you photos of the finished book, followed by a final PayPal invoice for the balance due plus shipping. When I recieve your final payment, I'll ship out your order and email you the tracking number on the package. I am happy to ship to international customers who are able to pay in American dollars using PayPal only. I must declare the full value of the package when I ship overseas. It is illegal to do otherwise. I always insure overseas shipments when insurance is available. I am not responsible for any customs fees, tariffs, or taxes levied by a foreign country into which I'm shipping a book. Those are the responsibility of the customer. I like to use FedEx Ground inside the United States and Priority Mail International for overseas shipping. I don't know the exact shipping cost until I have your shipping address and can weigh the finished book in its shipping box. Listed prices on already-finished books do not include shipping. Returns are accepted on already-finished books only as long as they are in brand new condition when you ship them back to me. There are no returns on custom orders. You must email me to purchase a book from my "finished books for sale" pages on this site. If I am shipping your book inside the state of Illinois, I will be adding 9% Illinois sales tax to the cost of your order. Look up the Lincoln Bookbindery in Urbana, Illinois for cloth hardcover binding in quantities from 1-100. I do not repair old books. I cannot put a name or lettering on a book that you already own. I can only do that with books I make. I look forward to working with you to create the book you are imagining. Please contact me to discuss the details of your possible order. Every detail affects the price and I can't give you a quote for YOUR order until we discuss the specifics. Blank books can be used as journals, guest books for wedding or other events such as retirement and anniversary parties, sketchbooks, travel journals, a place to record family stories and treasured recipes...the uses for a blank book are limited only by your creativity. Would you like your children to read how mom and dad met one day? Consider having your emails printed and bound into a volume that can be handed down through generations. I can bind printed pages into a book that is durable; sewn together with actual thread. Email me to discuss a project like this. I do custom rebindings for collectors' editions as well as custom boxes for special volumes. Every book on this site has been made entirely by me, by hand. Please take your time to peruse the gallery links above. What you are paying for when buying a book like this is the time and care involved in the design and assembly. The more complicated the construction, the more expensive the book. These are REAL books that are made to last. I have a number of already-finished books for sale. These books cannot be personalized, but are 100% finished and ready to ship. Please email me if you'd like to purchase one of these. Click on the link for "finished books for sale" and "finished books for sale 2" to see everything that is currently for sale. I'm located in east-central Illinois. You can follow fine blank books on Twitter if you are a fan of infrequent Twitter postings. Items with the fineblankbooks.com logo are available from Cafe Press. These items are priced at cost. I appreciate the free advertising! I am still in disbelief that you are able to conjure and materialize a book from my head - are you psychic? The book arrived today. It is PERFECT. It is just as I had hoped for, but couldn't find in any store. I'm glad to have had it handmade by a real person rather than by a machine or a sweatshop in China. So...way to go. It's very nice. We will be happy to keep it. Forever. I was able to find some private time and open up the box in its entirety late last week. The book turned out wonderfully. I was with my finace's sister...and it actually made her cry. Considering this was purchased and transacted sight unseen, I feel that you created a book exactly as I envisioned it to be. OMG!! I cannot believe that's it! The Book! Everyting that I dreamed of with space not only for research, but maps and drawings and the paper is to...die...for. Hee! and something that will be treasured by my wife for her lifetime, and by our descendants for years thereafter. This whole process of collaborating by (email) has been very rewarding, and one I look forward to repeating at a future date. 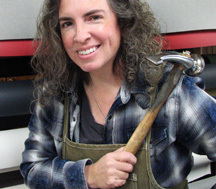 Having an artist and craftswoman help to refine and realize your vision is a pleasure. I wanted to take a minute and say thank you so much for the phenomenal book! It surpassed every expectation I had and is truly a fantastic piece of work. It really made my month to receive it! Thanks also for the guidance you gave me during the planning process; you were able to take my vision and make it a reality, which isn't easy and is very much appreciated by me. It was a pleasure doing business with you and I hope that I will have the need for another book in the future. If I do, rest assured, you will be my first email. Got my book today!! Most beautiful book I've ever owned. I can't wait to show it off and fill it with our engagement pictures. Thank you so much for going above and beyond to make exactly what I wanted!!! The simplicity and class of the book is perfect for Josh and I. He was also incredibly impressed. You have such a gift, I wish more people knew about you because this is awesome! The book arrived this evening by courier and I'm immensely impressed; jaw dropping, as you say it. I love it as does my family. You've done a stunning job and all I can do is thank you very much for your time and effort you put into this. Ur book made my husband cry!! I'm in eternal debt to u. He was so impressed by ur art n detail of his logo. God! His surprise was priceless. Thank u so much for making such a special gift. I received the wonderful book you made for me and it is AMAZING!! The cover is so beautiful and it smells so good! I wasn't expecting the smell!! The quality of the leather is just fantastic! I've been showing it around to everyone; they are so impressed with the craftsmanship and the artistry of the piece. You've truly gifted me an heirloom which will be treasured for many years to come. Thank you so much for sharing your amazing talent and the wonderful gift! I got the book earlier today and just got the time to write an email, and I have to say: Wow! I'm stunned! This book is amazing! I'm looking at it right now and I can't believe how nice it is! The box is the perfect color, the book is perfectly sized, the pages have the right number of lines (and don't mousetrap, or whatever it's called)...I really appreciate the work you did with this. It was worth every penny. The pictures don't really do justice to it; the symbol (on the cover) is perfect; closer to the original than the one I drew even; and the silver leather is probably better than the platinum I originally chose, and, even better, it will last forever because of this beautiful box! I just wanted to let you know what an awesome person you are. I know it was not easy dealing with me but throughout this entire process you have been professional, courteous, and a blessing. The book is utterly gorgeous and I cannot wait to have it in my hands to begin to document my spiritual path and my progression for higher enlightenment in it. I think it is the perfect muse for that particular task. I am continually thanking the gods and goddesses that they led me to you and I know that you are a gift straight from them for travelers like myself and many others. Until later...brightest blessings! Truly magnificent. Thank you so much. What a fine thing to add to our world. It's been a great pleasure. I shouldn't be surprised if we look for more reasons to make books! I don't know what I'm more thrilled with - the way you so beautifully implemented my "vision" or that these memories of such a nice time in my life will be captured forever. You have exceeded every expectation. Thank you so very much! The guest book just arrived and I opened the box with such anticipation. Honestly, it took my breath away. Every detail is beautiful - magnificent. I am so grateful I found you online. I can't imagine this being done better or closer to my vision for this gift. I'm so eager for my family to be together this weekend so we can present this gift to my sister. I know she will fall in love with it. Thank you for your beautiful and caring work. I just wanted to say that if anyone needs a book made, I will be recommending you. It is absolutely beautiful and perfect for my craft. I just wanted to send you this and let you know that if anybody asks, you can show them this letter, because your work is worth the money, the service was great, you stayed in contact with me on the updates and I don't mind spending the money on something that will last a long time, and the quality of the book shows its value. I just stumbled upon your custom book site and felt irrepressibly compelled to tell you that yours are, without question, the finest, most intricate and beautiful books I've ever seen. You obviously treat your work as an art rather than a business - a policy, I'm sad to say, I've never seen anywhere else. I've bookmarked your page and will most definitely be visiting it the next time I need a book of any quality. I just wanted to tell you that the book arrived the other day and I got the time to pick it up today. It's everything I thought it would be and more. Fantastic work! I'm so happy I got a hold of you online and decided to have a go. I can't wait to do another project with you - maybe not as fancy as one of Sweden's premiere golf clubs - but surely for something else. The book just arrived. I ran down the steps, practically jumping with excitement. When I unwrapped the book, my breath stopped, my hands trembled, my vision blurred. I am in awe of you and your artistry. I don't have words to express how amazing the book is and how much I love it. There's nothing like the feel and smell of a real book; and this may very well be one of the most real books I've ever held. It literally brought tears to my eyes because once all of this is over, all of the wedding excitement and craziness, when the music stops, the lights turn off, and the guests leave, we will have each other, our memories, and this book. I'm going to use this book to keep all of our RSVP cards, photos, and notes from guests (along with) other little mementos of the day. Thirty years from now, when our kids ask about our wedding day, I will bring out this book and show them and hopefully it will be passed down to their kids and so on. I just love the thought of having something that will withstand the test of time. Continue doing what you do - good books are good for this world. I have begun to fill (the pages of my book) with thoughts that will, I hope, be of enduring interest, at least enough to merit such a fine vehicle. I continue to enjoy the design and quality of it every time I get it out. I am really glad too that I spent the money required to get what I really wanted, including the box. And the cover sybolism has, if anything, grown more important over time, as I have some to appreciate the depth of the insights it represents. Thanks again for your work! It would never have come about without your distinctive influence and skill. Happy New Year to you. I’m honored that my book made your photo collage (not that I can take credit for your work!). I have begun to fill its pages with thoughts that will, I hope, be of enduring interest, at least enough to merit such a fine vehicle. I continue to enjoy the design and quality of it every time I get it out. I am really glad too that I spent the money required to get what I really wanted, including the box. And the cover symbolism has, if anything, grown more important over time, as I have come to appreciate the depth of the insights it represents. Thanks again for you work! It would never have come about without your distinctive influence and skill.